« Change Your Feed Links! Yarn: 100% merino wool from a men’s sweater. The yarn is cabled and the colour is heathery, which makes for very interesting texture. Dimensions: The perfect size for my hands! 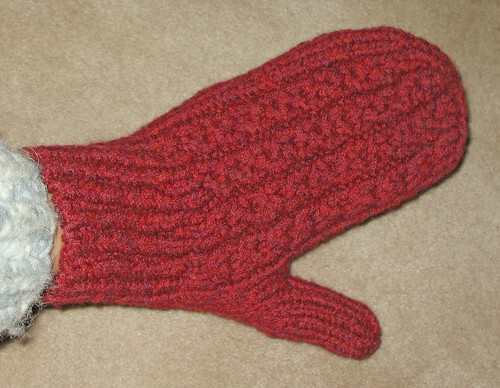 Pattern Notes: This is a basic mitten pattern with a few cables tossed in. It’s the first time I’ve ever knit a thumb gusset, but it worked out quite well. I think I may have cast on a few more stitches than necessary at the beginning, but it fits well. I’ll have to remember next time to cast on 6 stitches less than my common sense would suggest. My plan right now is to knit a little sleeve inside the mitten to keep the wind out and bulk it up a little bit to make it tighter around my hand. I’d rather do that than line it with fleece, because if I’m going to knit something in merino, I want to take advantage of its non-sweating properties, darnit. Would I knit it again? I may end up offering this as a free pattern, so I may knit it again to test it. 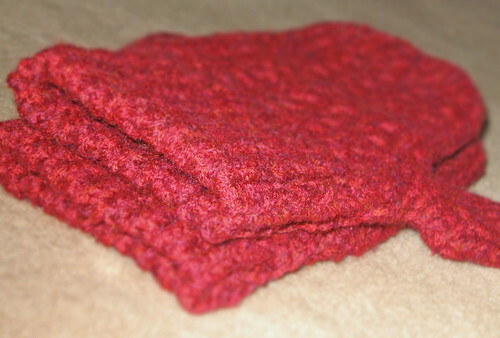 I usually only need one pair of mittens at a time, but maybe after Christmas I’ll knit another pair as backups. 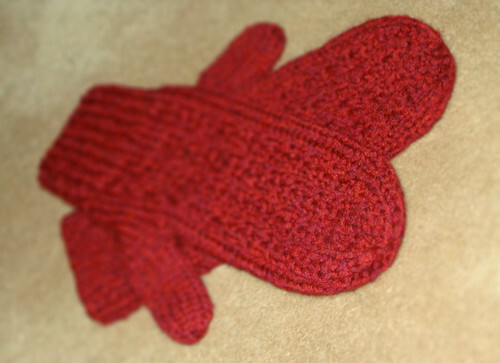 You could always give the second mittens away – donate them to Dulaan – or have someone test knit them for you (I would, if you want). That perfectly rounded mitten-top is fantastic. I just made a pair of mittens, using a star decrease, and I am less-than-satisfied. I love the idea of putting a sleeve in them too. You should definitely add that if you decide to offer the pattern! OK, here I am telling you what to design. Urgh. Sorry! Hmm, how does one send things to test knitters? Do you have to buy them an internet beer? Do you know a good place to get alpaca in Toronto, or near there? One of the other Canadians I know is looking for a good source. This entry was posted on November 14th, 2006 at 7:09 am and is filed under Finished Projects, Mittens, Projects. You can follow any responses to this entry through the RSS 2.0 feed. Both comments and pings are currently closed.